In my hometown, there is abundant papaya. But my family does not like to have more of it. I made this papaya paratha and didn’t tell about its ingredients. Everyone liked and devoured it. 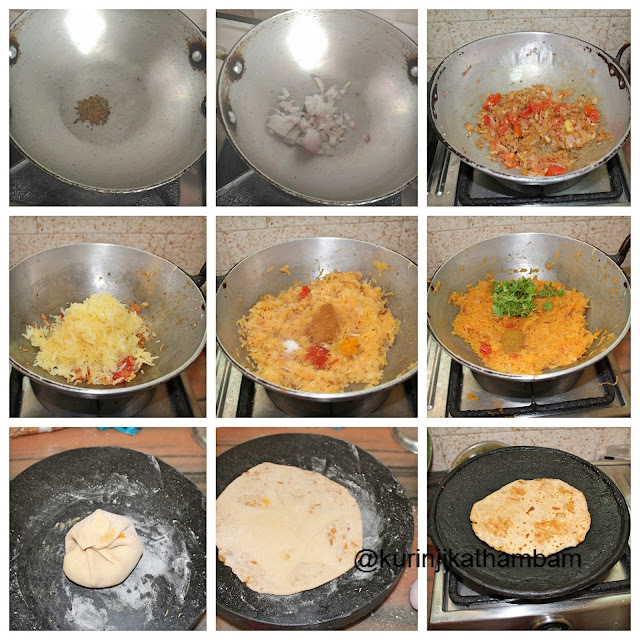 Preparation Time: 5 mins | Cooking Time: 20 mins | Yields: 5 nos. 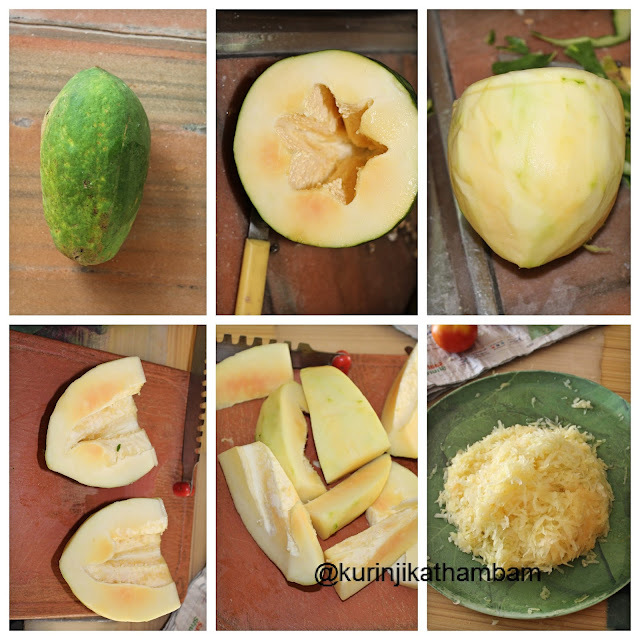 How to make grated papaya? a. Cut the papaya into two halves horizontally. b. Peel the skin of the papaya using the peeler. c. Then cut it into small pieces. d. Grate them using the grater and keep it aside. 5. Now add the finely chopped tomatoes and sauté till they become mushy. 6. Add grated raw papaya (from d) and sauté till the raw smell of the papaya goes off. 7. Then add red chilli powder, coriander powder, turmeric powder and salt. Sprinkle little water; Sauté till the papaya becomes tender. 8. Add finely add garam masala powder and chopped coriander leaves (if used). Mix them well and cook for 2 mins. Allow it to cool down completely. 9. Now divide the dough (from 2) into a lemon size balls. 10. Now dust the dough ball and roll it into a small circle. Keep 2 tbsp or required amount of stuffing in its center. Then bring the edges to the center. 11. Again dust the stuffed balls and roll it carefully. 12. Heat the tawa and transfer the papaya paratha, sprinkle the oil and cook both sides till the black spots starts. 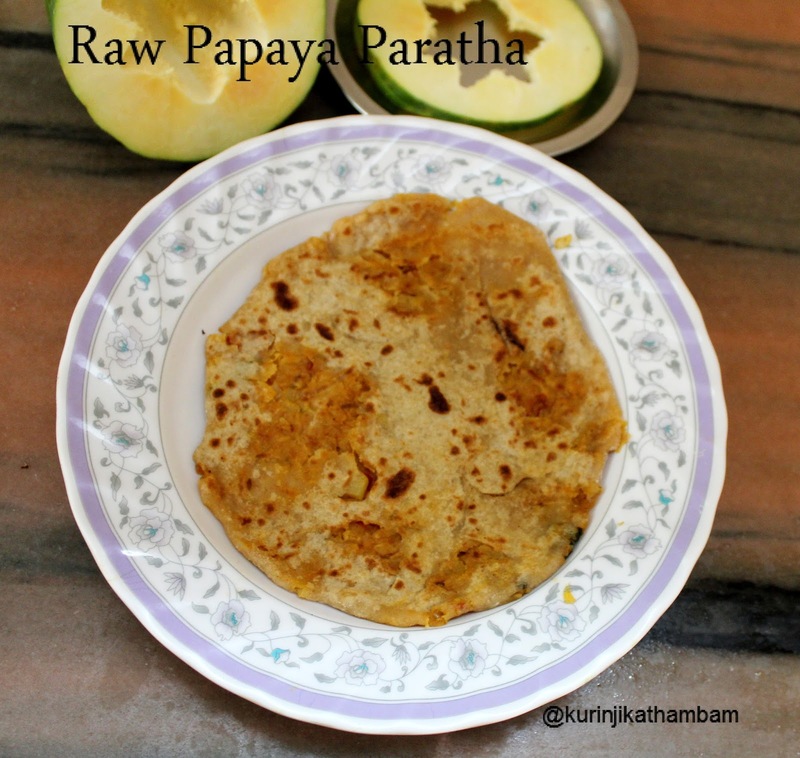 Really healthy and tasty raw papaya paratha ready to serve. Serve it with raitha. 1. Sprinkle required water till the papaya becomes tender.